Hath God Said? meets the devil’s challenge. R.C. 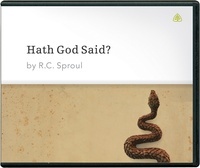 Sproul proclaims and defends the world-transforming truth that God has spoken in His Word. He shows that communication requires an absolute standard of truth—and that Scripture is that standard. And R.C. demonstrates the failure of all attempts to make the Bible partly true and partly false. Hath God Said? will strengthen your faith in the integrity of the Bible—and your ability to proclaim and defend His holy character in your world.